1. Pre-heat oven and oven tray to 230ºC for 10 minutes. 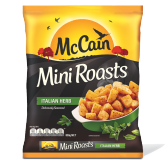 Spread your McCain Sweet Potato Wedges, McCain Italian Herb Mini Roasts and onion in a single layer on the tray and place in the middle shelf of the oven. Bake in the oven for 14 minutes, turn and continue heating for a further 12-14 minutes. Cook to light golden colour. 2. NOTE: Watch carefully during the final minutes of preparation. When using smaller amounts, reduce cooking time. Do not overcook. 3. When roasted, pour into bowl and serve with fresh thyme, rosemary and fresh rocket leaves. Dress with olive oil and season with sea salt and freshly ground pepper. 1 Pre-heat oven and oven tray to 230ºC for 10 minutes. 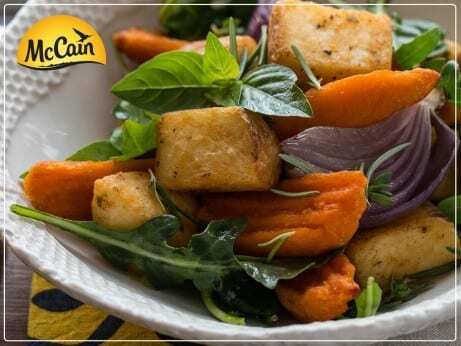 Spread your McCain Sweet Potato Wedges, McCain Italian Herb Mini Roasts and onion in a single layer on the tray and place in the middle shelf of the oven. Bake in the oven for 14 minutes, turn and continue heating for a further 12-14 minutes. Cook to light golden colour. 2 NOTE: Watch carefully during the final minutes of preparation. When using smaller amounts, reduce cooking time. Do not overcook. 3 When roasted, pour into bowl and serve with fresh thyme, rosemary and fresh rocket leaves. Dress with olive oil and season with sea salt and freshly ground pepper.